Panorama 7 to 9 inches. Very full double Coral with lighter coral edge. 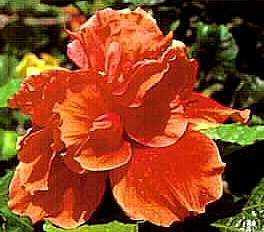 Best growing and flowering double...so vigorous it is used as a hedge in the Tropics. The Panorama flowers are so full, they look like 5 flowers in one!